So I've spent the afternoon working on my new army and here's what I have to show for it. I managed to get 6 jetbikes built in just over an hour (they go together quick). I went ahead and finished one to see what the end result will look like. I'm planning on an assembly line approach for the rest of them. I'm going much darker/dirtier with these guys than I normally do when I paint, I'm tired of the pretty, clean stuff without any wear and tear. I find sometimes it's easier to do them a bit battletorn, It means you don't need to remove some of the marks of the casting, and adding dirt, grit ect. is easy just don't go mad with the bullet holes!! I would suggest painting the gems - I think it adds to the Eldar feel immensely. But that's a small personal preference, and I really love the rest of the model! Thanks guys, I've got three of them done now. The next batch will be 3 models. I think thats enough models that once I finish the last one, the first one is completely dry and I can motor right through them. I'm torn on whether or not to do the gems, I like the look both ways. Peter: The stripes and snake are freehand. I don't know how you put them together so fast. This is the fastest for me ever. It takes about 15 minutes to get one off the sprue and ready to prime. I go quicker when I work assembly line style. sovietspace: I went with the simple, book look to them so I wouldn't have to figure anything out on my own really. I just flipped open the codex and copied what was there. I think the red and black is instantly recognizable like certain space marine chapters are. I think it adds to the feels of them. zealot: I would have loved to swing by the store today but the wife had me out running errands all day, it wasn't until this evening that I managed to sneak away for a while. Now I need to get started on my magentized bases for these guys. Ron, Great job on the bikes. 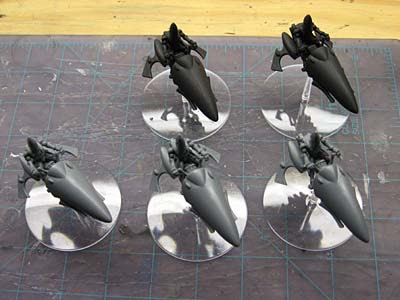 I started work on a Saim-Hann force 2 years back but then dropped it for other plans and sold the models off. I did like the bike models though. As for the paint job, I really like it, but agree that the gems being painted with offset gemlike colors would REALLY make the models look finished. Can't wait to see the final full size army all done! Ron, awesome start- I always love to see another take other then my own on jetbikes. I'm a bit behind on emails, and I still owe you a reply on your list ideas, which I will do. Can't wait to see your Saim-Hann on the table! Ron, that is looking sweet! Can't go wrong with them jetbikes!! Looking forward to see more saim hann models you have coming up! 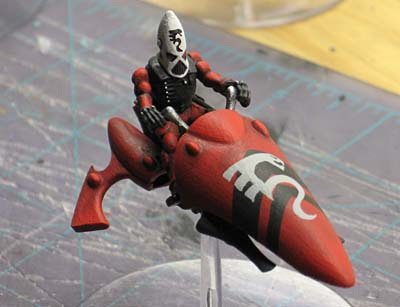 The jetbike looks great, a nice change from painting the white scars. The bikes look amazing mate, and I really like the deep shade you have used to bring their definiton out. Great stuff as usual! I'll find a suitable green for my gems and pick out a couple. It probably will give it a more finished look... I just don't want to admit it. I'll see if I can get new pics up in a day or so of the "new" version. Great paint on the one you've finished though. I like it a lot! you should get the windrider box set it's brill if u just started a Saim-Hann Army contains everything you need. The Inner Geek: I painted one of the gems and I have to admit, it does look a little more finished now. I think I'll leave some of them as part of the jetbike and make only a couple into gems. Anon: I tried to get the Windrider box set, it can't be ordered anymore apparently through my FLGS. But you're right, it's absolutely perfect for this army. Good call on the darker red. It looks really good. Your free hand skills are outstanding as well. Very nice work I hope to see lots more. I also think you should do the gems.